A group of seven of us from the Canberra Photographic Society visited Lamington National Park for a few days of walking in the rainforest. This is a view from Rosin’s Lookout on the way in. 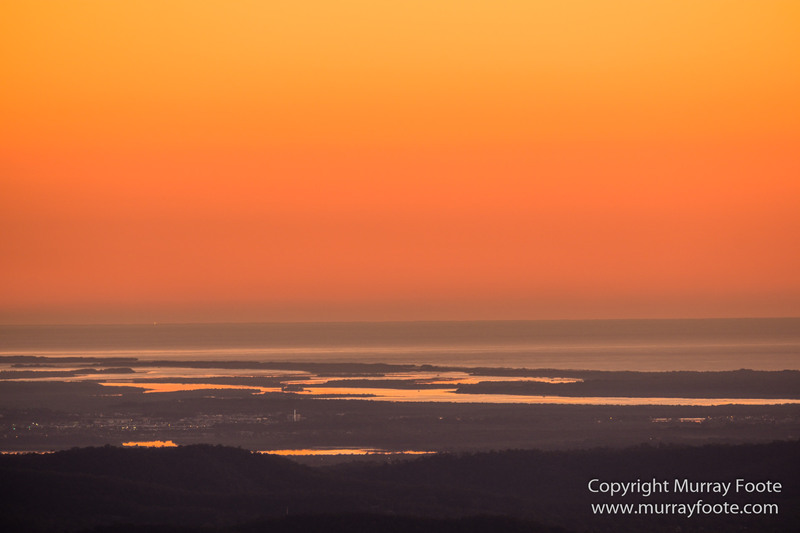 Mt Warning is in the middle in the distance (We are looking from Queensland towards New South Wales). Ship’s Stern is to the right of Mt Warning and Springbrook Plateau to the left, rising towards Best Of All Lookout just left out of picture. 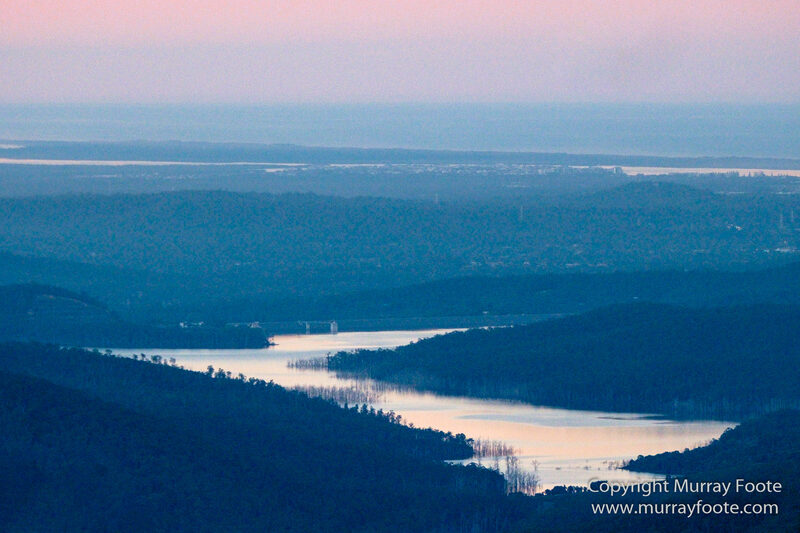 Also, Springbrook National Park is to the left of Mt Warning and Lamington National Park to the right. From pretty much the same point, here is a farm far below in the valley. All sorts of interesting details if you click for a larger view. 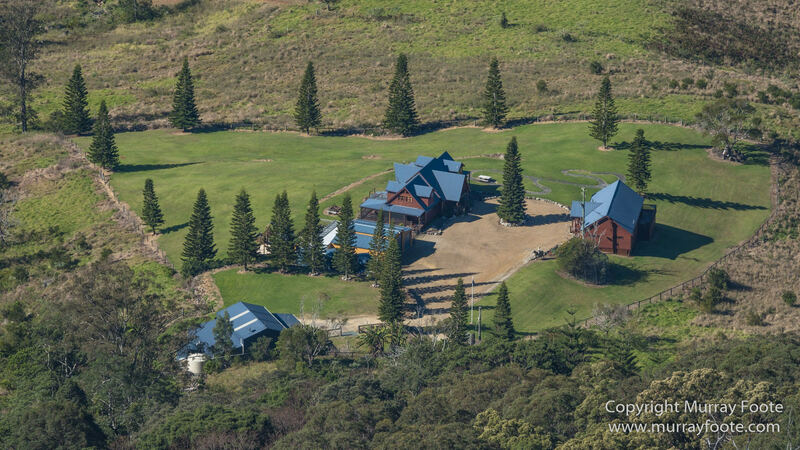 We stayed at Alcheringa, a wonderfully appointed house and cottage with magnificent views, and right next to the main complex of Binna Burra. We are looking north but I’m not sure of the name of the mountain. 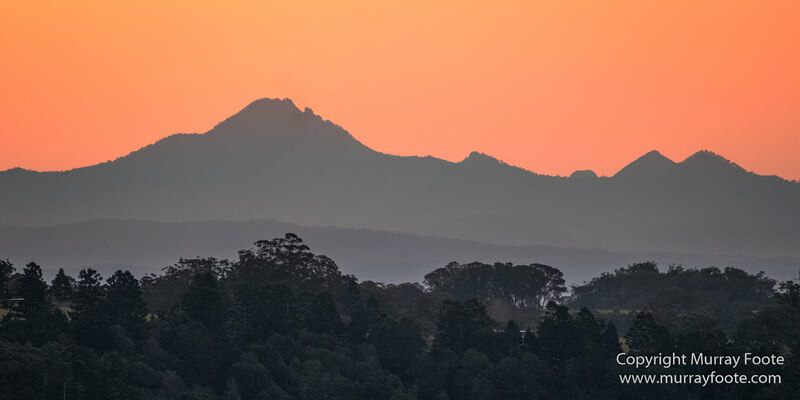 Maybe Mt Tamborine. The last two images were in the evening when we arrived. This and the next are before dawn on the next day. All from Alcheringa. The first full day we went for a walk in Dave’s Creek Circuit. 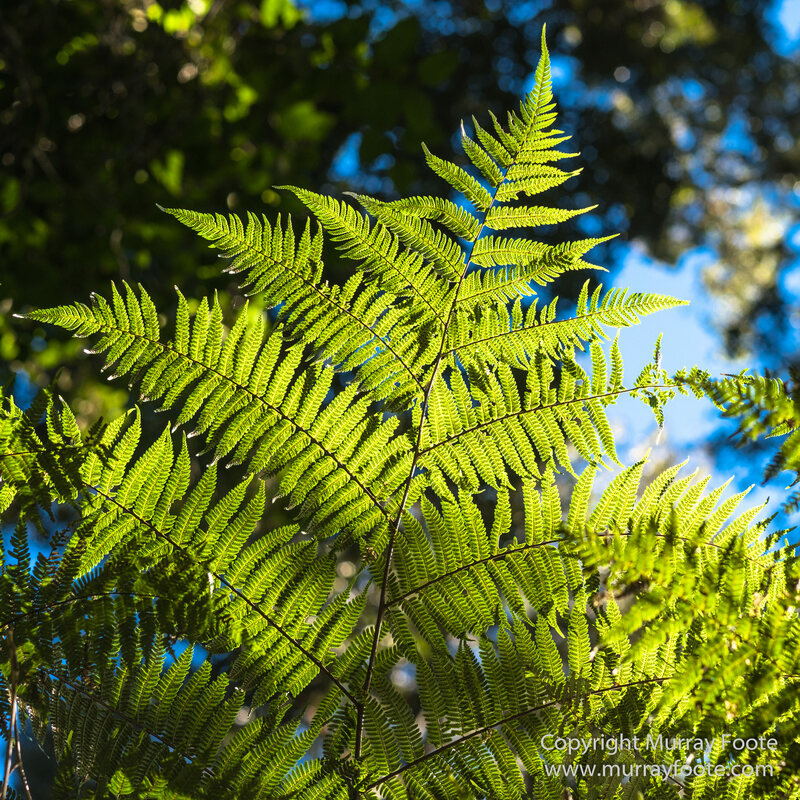 Here are some backlit ferns along the way. 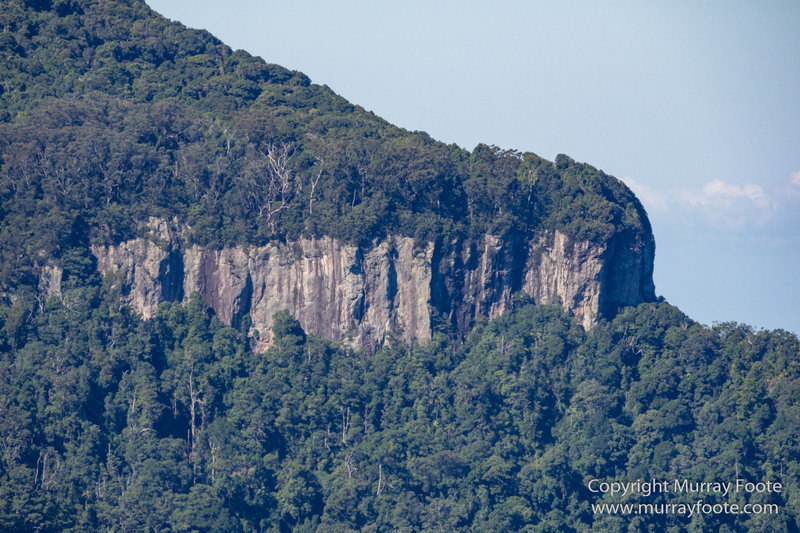 From one of the lookouts, a view of a distant cliff in Springbrook National Park. 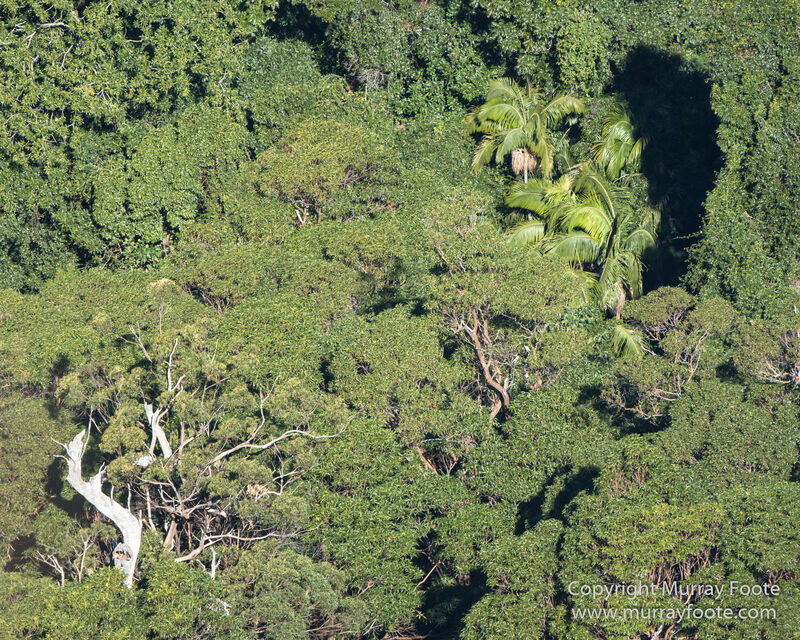 Looking down from the same lookout on the distant forest. 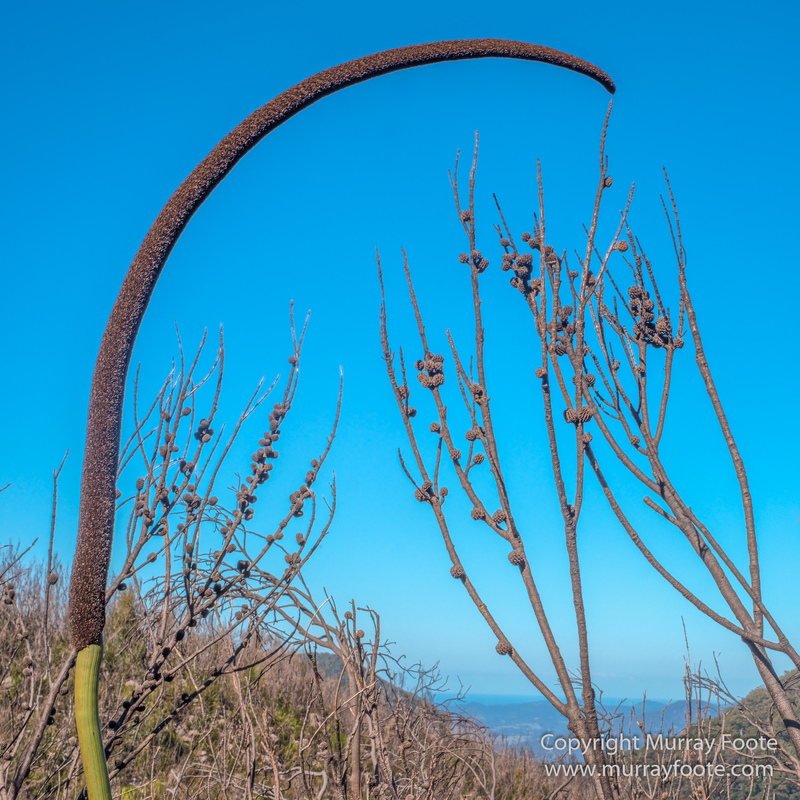 A Xanthorrhea (grass tree) flower head and bare Hakea branches. 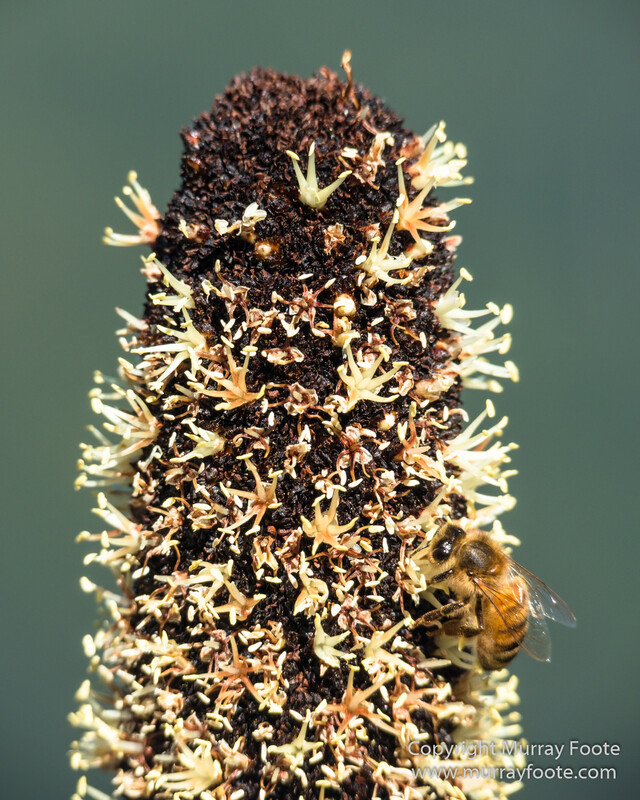 The tip of another Xanthorrhea flower head (complete with bee). 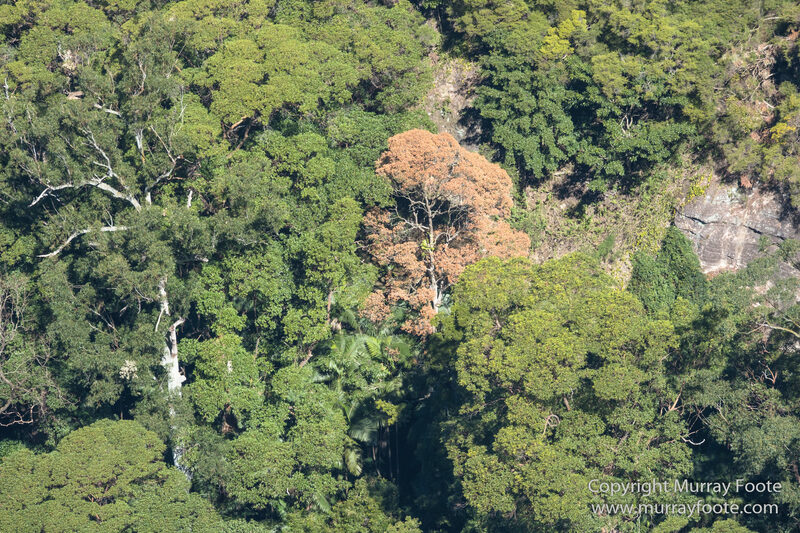 Trees and cliff faces near Molongolee Cave. 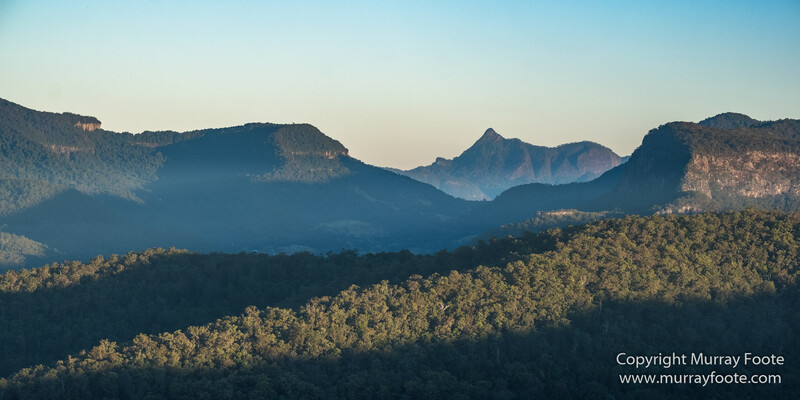 Looking down into the distant valley from Numinbah Lookout. 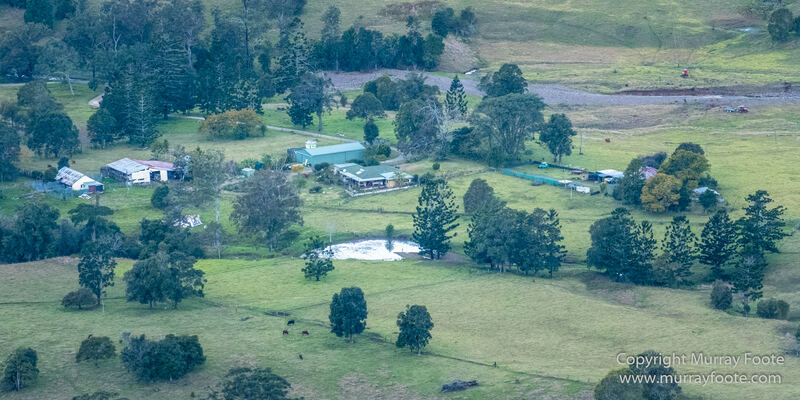 That’s not a farm below; it must be a hotel, religious retreat or conference centre. If you click on the image to see it larger there is a man on a horse beside an old wagon. However, I think it is a statue and not a real horse and rider. Surprise Rock with tree and xanthorrhea. 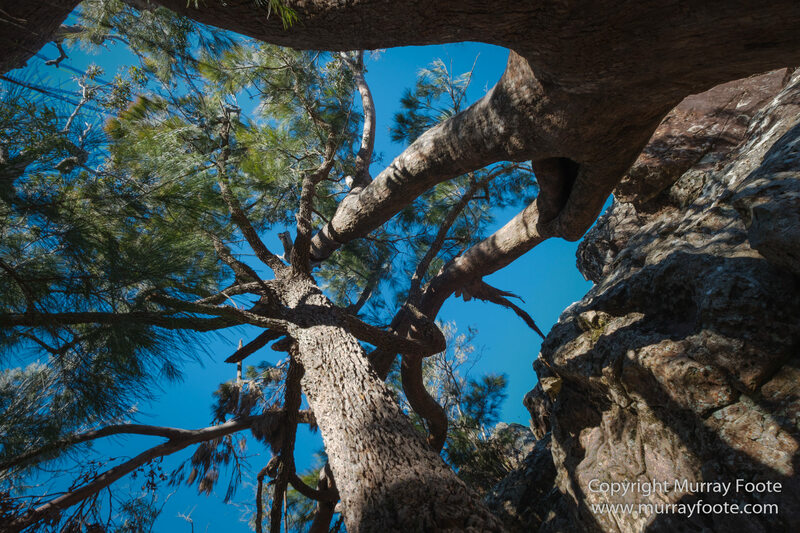 Looking up at the tree beside Surprise Rock. 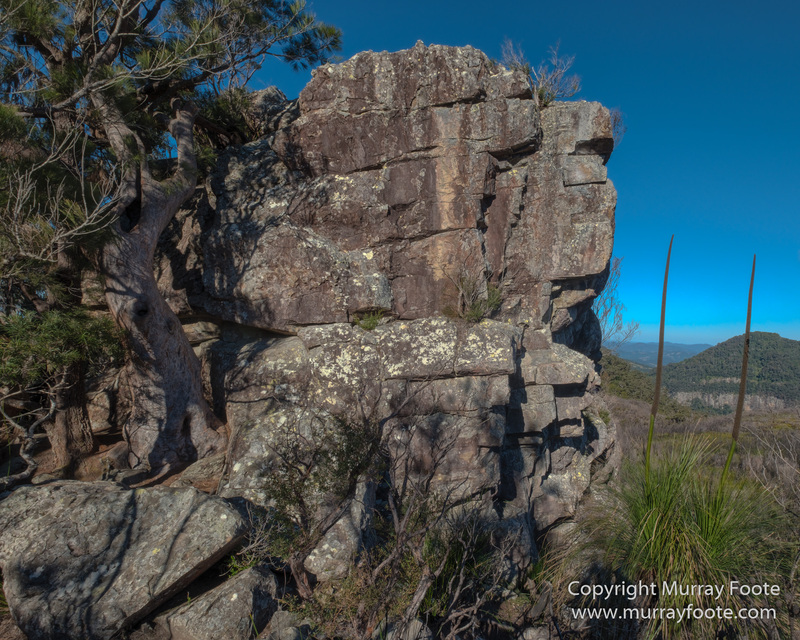 The next morning, we went a walk to Tullawallal Circuit, where there is an ancient stand of Gondwanaland Beech trees. 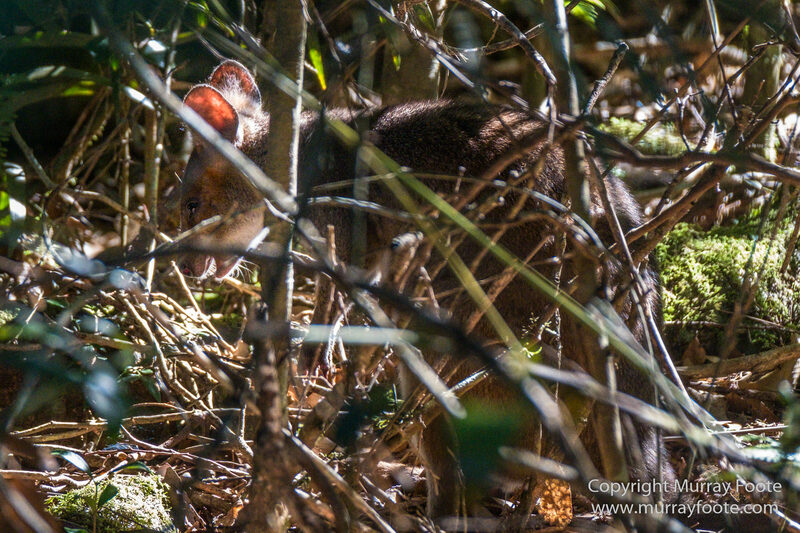 This red-necked pademelon was at the top in the undergrowth. 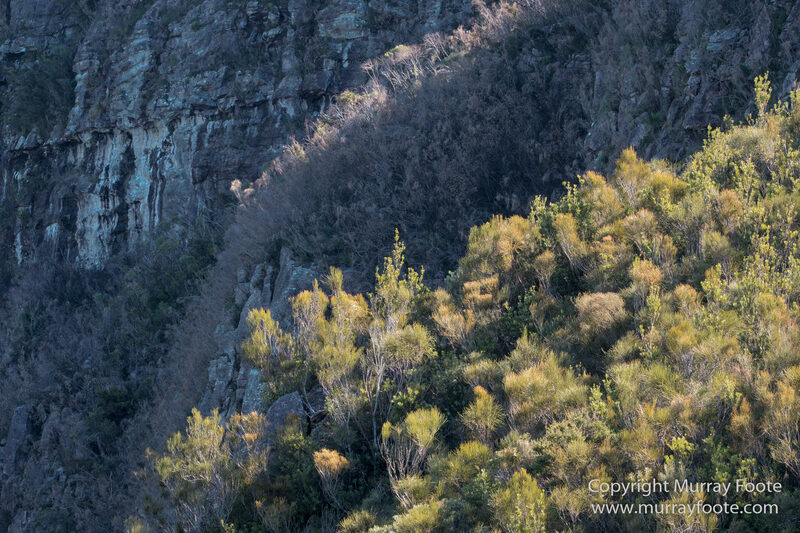 Not the best of shots but taken with a long lens in broken light and what can you do? 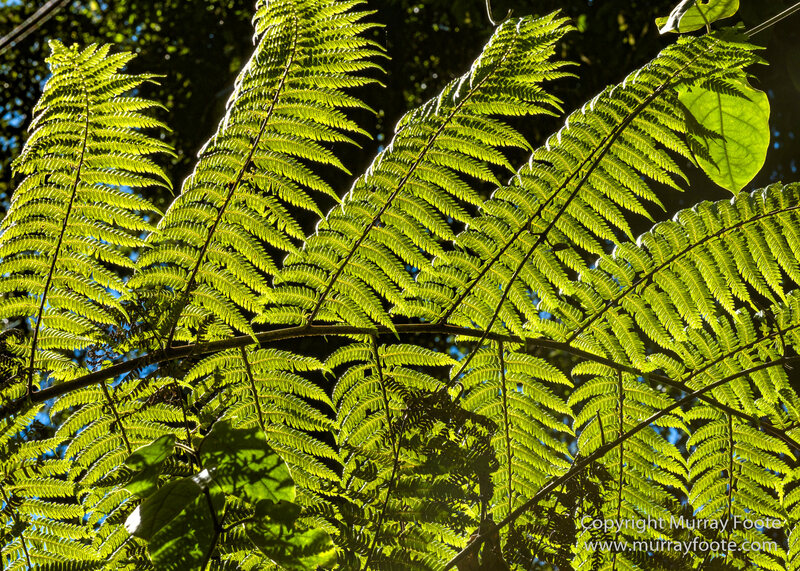 A branch of a tree fern nearby. 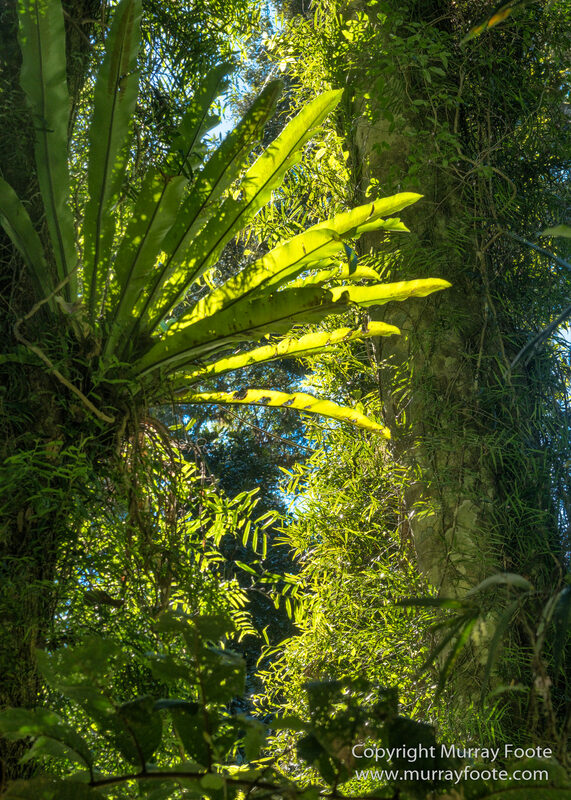 An epiphyte catching the light as it grows out of a Gondwanaland Beech tree. This entry was posted in Australia and tagged Alcheringa, Australia, Binna Burra, Bushwalking, Dave's Creek Circuit, Lamington National Park, Landscape, Nature, Pademelon, Photography, Queensland, Travel, Wildlife. 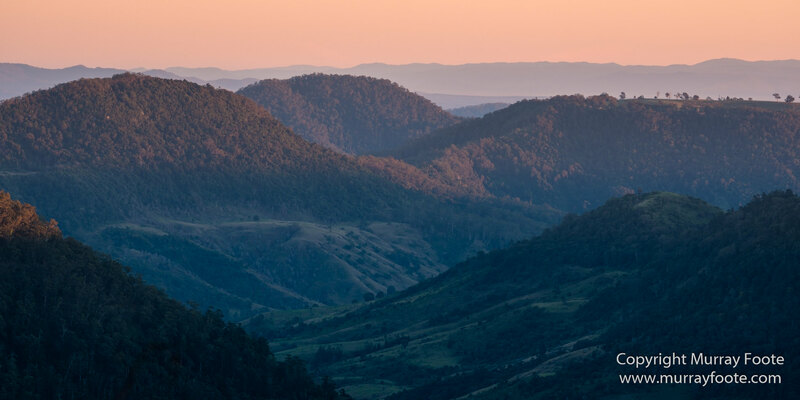 A part of Lamington Plateau I’ve not been to, lovely images. The light through the paddymelon’s ears is nearly luminous. A great place to visit and go for walks in. I was last there in 1981. Apart from that I haven’t seen much of Queensland other than some lighthouses down the east coast and Torres Strait, and a brief stop in Mt Isa, all in the 80s. Sounds like time you did a bit of exploring ?? Definitely scope for that. So many places to explore though. Wow. You’re teaching that camera some pretty impressive apps!! I enter my URL but your software doesn’t like (or believe) it. Especially love the color in the first dawn image. Before dawn, actually. Especially perhaps in the Eastern seaboard where the sun comes up over the water, the best light is in the hour before dawn. Getting up for it is the only problem. I hear you on those early risings….